The Cuisinart Ceramica XT Nonstick CookwareSet is a 11-piece non-stick cookware which has an aluminum core for fast even heating, while its smooth, nonporous cooking nonstick surface provides lasting food release and easy cleanup. The Cuisinart Easy Grip™ silicone handles are designed to provide a secure comfortable grip and stays cool on the stovetop. 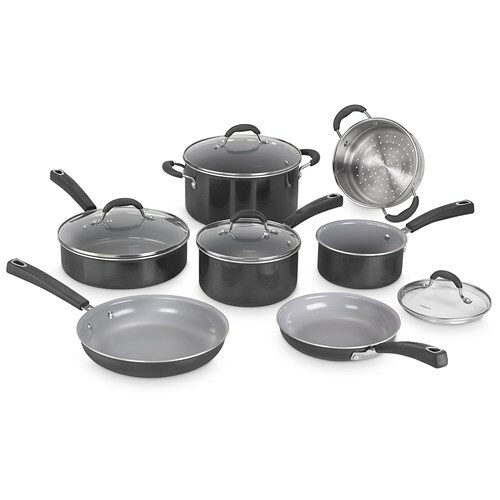 The Cuisinart 11Pc Ceramic Nonstick XT Cookware - Black has many exciting features for users of all types. 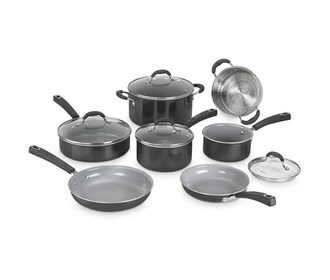 The Cuisinart 11Pc Ceramic Nonstick XT Cookware - Black is sold as a Brand New Unopened Item.